Interesting, problem-solving products . . . are just a click away!!! Check out some of the interesting and different products, in the Website Stores. You just might find something, that you always wanted. askalanaquestion.com . . . product information and ordering are just a click away!!! Scroll down to browse through information on a variety of Pool and Spa products. You'll find products that will help you solve problems, products that will make pool or spa maintenance easier, alternative ways to sanitize a pool or spa and lots more interesting and different products. The Website Store Directory contains an alphabetized listing of all products for sale. We don't simply sell products, we help you make a better-informed choice, by providing all the information, you might require. All items ordered will end up in the same shopping cart, no matter on which page of this website, the items are located. These items can be ordered on-line, from askalanaquestion.com, with convenience and security. All Major Credit Cards and PayPal* are accepted. One order does it all. Shop with complete, on-line safety and security. Shopping is hassle-free, with nothing to join! A complete line of testing products for homeowners and professionals. Ten (10) All-Digital Tester Kits for every pool or spa need, from pool or spa owners to professional or facility use. Suitable for use with every type of sanitizer. Easy to use, complete with pictorial and multilingual instructions. Includes everything. On sale, for a limited time. For testing Salt, TDS, ORP Oxidation-Reduction Potential)) pH and Combined chlorine and more, using interchangeable and replaceable sensors. Dip and read, electronic convenience, with reliability and ease of use. Variety of PockeTester models are designed to meet. On sale for a limited time. Perform the lesser-performed tests, required to solve some types of pool or spa water problems. The right information can help make a big difference. Kits are available that test for Copper, Iron, Manganese, Phosphates, Biguanide, Biguanide Shock, pH, Salt and Chlorine using FAS-DPD. A full-Line for every pool and spa need. Includes many specialty strips. Most are fast Dip-n-Read. Test strips, for most common tests, are available as a 3-in-1, 4-in-1, 5-in-1 and 6-in-1 Strips. Strips are available for Copper, Iron, Nitrates, Phosphates, Borates, Biguanide, Peroxide, Salt, Sodium Bromide, MPS, High CYA and more. All Kits are on sale. We supply FACTORY FRESH chemicals, replacement refill packs and individual reagents, for all models of the ColorQ Testers. In addition, we have all types of WaterLink SpinTouch Disks and supplies. If you have a LaMotte tester, we have the replacement items or can special order them. Everything a Home Owner or Professional might need to test pool or spa water. Click Any Image or Link, for Product and Ordering Information. A complete line of mineral treatments, stain prevention and removal products. This non-toxic chemical can dissolve stains and discoloration, caused by iron, copper or manganese, from all types of pool or spa surfaces. Once the stains have been eliminated, these metals are now back in solution. Follow with a Liquid MetalTrap or Pool Refresh, to help avoid a recurrence, after chemicals are added. A bottle treats 10,000 gallons. A true chelating agent, that converts copper, iron and manganese, into a form that can avoid stains and discoloration. It works over a wide pH range, does not degrade into phosphates. Usage is based on 1 quart per 10,000 gallons, with concentrations under 1 PPM. It will not remove stains. The Stain Remover should be used to dissolve stains. Once the stains are removed, using MetalTrap Stain Remover, the addition of Pool Refresh will convert the iron, copper, silver and manganese into a form, that can be filtered or vacuumed, out of the pool or spa. This regiment leads to the physical removal of the metals and helps avoid recurring problems. Removes phosphates, as well. This 3-part regimen uses MetalTrap Stain Remover to remove the stains and discoloration. Followed, by the addition of Pool Refresh, to precipitate the iron, copper, manganese and phosphates, for permanent removal, by filtering and vacuuming. Liquid MetalTrap is added to scavenge up any lingering trace metals. Get bundled savings. This cartridge-like filter attaches to the garden hose, used to add new water to the pool or spa. Available in 3-sizes, it helps you avoid adding dissolved iron, copper and manganese, that might be present in the source water. Keep metals out and there will be fewer problems. If sediments are present, the Dual-Cartridge Filter is the preferred choice. Contains the same treatment chemicals found in the standard MetalTrap Stain Reversal Kit, plus a choice of one of 3 models of the MetalTrap Filter. The addition of the MetalTrap Filter helps assure that more metals are not added, with subsequent additions of new water. Larger pools might require an additional Stain Reversal Kit. Treat the problem right and you can avoid future recurrences, after each addition of new water. Get bundled savings. Well water or water from poor quality sources can contain sediments, as well as dissolved metals. Sediments will clog the standard MetalTrap Filter, shortening its life. The MetalTrap Dual-Cartridge Filter has a 5-micron Sediment Filter Cartridge, that is reusable and washable, to help keep sediments out of the second MetalTrap Filter Cartridge. This second cartridge is replaceable and is the one that removes the dissolved metals. This is how to keep sediments and metals, from being added with new water additions, when lower quality water sources are used. 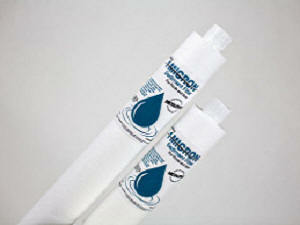 This 5-Micron, Pleated, Sediment Filter is washable and reusable and has a long functioning life. It will help remove sediments, such as oxidized metals, sulfur, contamination and more. Comes complete and ready to attach to a standard garden hose. If you know the water can be a problem, this can be the solution. This filter cartridge attaches to the standard garden hose and removes fine debris, sulfur, trace pharmaceuticals, odorous substances and trace impurities. If the water supply is questionable, this product can help avoid problems. Available in pool or spa sizes. Click on any image for more information on these problem-solving products. The right products can solve many common problems. FIX A LEAK is the easy, long-lasting way to seal all types of leaks in pipes, fittings, equipment, walls and liners, as big as 1/8" in diameter, helping avoid costly repairs. Helps make a permanent seal, without a need to drain the pool or spa. For use in all types and sizes of pools, spas, hot tubs and swim spas. Insist on Fix A Leak. The original and best, for over 35 years. Don't start digging, without trying this product. Available in pool (32-oz) and spa (8-oz) sizes! The Pool Circulator is an inexpensive and easy to install device that dramatically improves water circulation. Helps to improve water quality and clarity, heat and sanitizer distribution. The Pool Circulator can improve circulation by as much as 1500%, eliminating dead spots, that promote algae growth. In most cases, it simply replaces a standard return fitting, providing improved circulation and results. Improved circulation makes everything better. For all types of pools. Many concrete crack repair methods have been tried, with little success. For example, epoxy injections are largely insoluble in water, but they cannot be forced deep into cracks. When Torque Lock Staples are used with epoxy, you can rest assured that the crack has been properly repaired. Why settle for anything less than a rock solid structural concrete crack repair or risk the expansion of the crack? Ultra Poly One Coat is the easy-to-apply, hybrid-epoxy, coating that creates a beautiful new look. This coating can be used on plaster, gunite, marcite, green concrete, fiberglass and quartz aggregate pools and spas. Choose from six stock colors. Custom colors are available. Easy prep and a 15-year warranty. Used in pools and water parks, throughout the U.S. No primers or sealers are needed and only one coat is required. This is the coating that lasts! Use a Premium Pool Graphics Mosaic Mat to decorate your pool floor, without using any adhesives. The image appears to be tiled on your pool floor, but that's just an illusion. Actually, you simply set one of these colorful graphics on the water and push it to the bottom, with a pool brush. Use one to cover some repair work or hide a damaged spot. Choose from 9 designs, in up to 3 different sizes: 10.5", 23" and 47". A custom monogram is a special order product. Filter cartridge cleaning has never been easier or more effective. Simple attach a garden hose, to the Blaster, and place the pool or spa filter cartridge on top of the rollers. Turn the water on and the rollers start to rotate the filter cartridge, while a series of powerful water jets clean, within the pleats, and wash the dirt away. It's all done, in just a few minutes. Suitable for use with Ceramic Spa Filters, with at least a 6-inch (15 cm) diameter. Choice of 3 sizes. Wash away the dirt, leaves and debris that could end up in your pool. Want a better looking pool and deck or patio area? Just connect to an ordinary garden hose. Choice of four handy, models: Homeowner or Industrial Grade. Spill some chemicals? Use the Water Sweeper Broom to sweep the area. Cleans pool or solar covers. Great on walkways, drive ways and garages. Quality American Made products, that are designed for premium performance. This economically-priced Pool and Spa Magnetic Water Conditioners help prevent and remove scale deposits, improve water quality and reduce chemical usage. No moving parts and uses no energy. Users report less scum caused by body oils and less water hardness issues. An easy solution for hardness problems levels. Just strap it around any return line. The Tormec Pool, Spa and Whole House Magnetic Water Conditioners help at two levels. There is less chemical build-up and less potential for scale build-up. Simply clamps around the pipe. Nothing to install and no need for electrical hookups. The powerful, permanent magnets are guaranteed not to lose power. Three more powerful models, for Pool, Spa or Whole House use. If high hardness is a nagging issue, this can be an effective solution. Sacrificial Zinc Anodes are used to prevent metallic parts, such as rails, ladders, underwater light rings, pumps, filters, heat exchangers, etc, from corrosion. The higher the TDS (Total Dissolved Solids) the more likely corrosion can occur, especially when two different metals are in immediate proximity, to one another. The source of the high TDS can vary, from natural to the addition of salt and the buildup of maintenance chemicals. Proven, time-tested, products to repair and help maintain your pool or spa!!! Make sanitizing easier, more consistent and more effective. 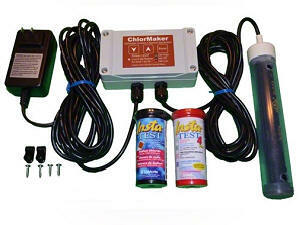 Salt chlorine generators are affordable and versatile. Three models of In-Line salt chlorine generators treat all types of pools, up to 20,000, 25,000 or 40,000 gallons. This is the easy and better way to chlorinate any type of pool. Easy to use, providing better control and results. Just dial-up the chlorine level, to meet the changing seasonal requirements. Eliminates the build-up of cyanuric acid or calcium hardness. Better water quality and better results. The Model SR salt chlorine generator, is a self-contained purification system, utilizing a natural process to generate pure chlorine. The electrolytic process uses a very low concentration of salt (3000 PPM) and generates free chlorine. Requires no plumbing and treats all types of above ground and inground pools up to 20,000 gallons. Full of features. Just hook it up and add the salt. It's that easy. Salt chlorine generators have been used to improve water quality and simplify the daily sanitizing requirements, for more than 30 years. The two MegaChlor models are Plug-n-Play, requiring no installation. With the CD model, you'll never over chlorinate again, with the available Chlorine Detection Technology. Operates independently of pump, heater or spa controls. Salt-cell rated to last for 7000 hours. Just add a small amount of salt, with each refill. Ultraviolet sterilizers are extremely effective at killing microorganisms, that are pathogenic, and are resistant to normal levels of chlorine or bromine. It is not a stand-alone sanitizer. Ultraviolet (UV) is typically used with salt chlorine generators, chlorine or bromine, in order to obtain the necessary oxidation and persistent sanitizing. Designed for residential pools, up to 15,000 gallons. BioPhotonX™ UV Light Conversion Technology captures and magnifies ultraviolet light, breaking down a portion of the water molecules and creating Free Radicals. These active Free Radicals attack, weaken and inhibit reproduction of algae and bacteria, allowing you to use less chlorine and fewer chemicals, in your pool or spa. Needs no installation. This is a simply effective way to reduce chemical usage. Suitable for pools up to 15,000 gallons. 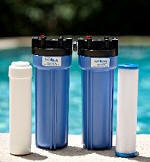 Two models of Solar-Powered, Dual-Ion, Ionizers/Purifiers - Mineralizers; for all types of pools, up to 32,000 gallons. Helps reduce Chlorine, Bromine and Algaecide usage, by as much as 80%. 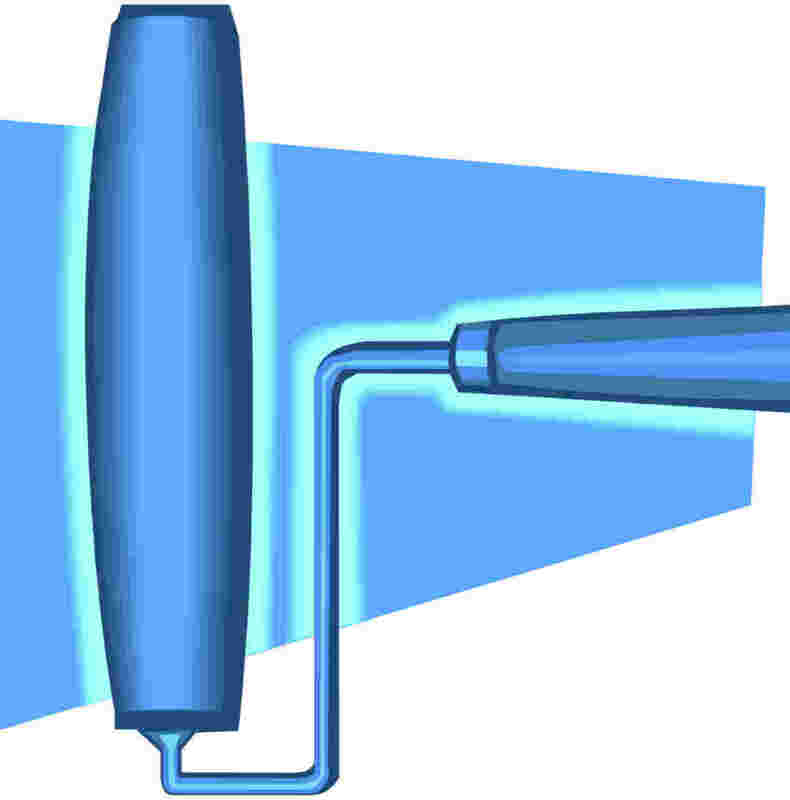 Dual ionization principal, for better results. No Installation, Plumbing or Electrical Hookups are required. Can be used with all types of sanitizers, with the exception of biguanide, and acts as a backup sanitizer. Replaceable anode lasts 3-4 seasons. Make sanitizing much easier, while reducing chemical build-ups and common algae problems!!! This is the better way to do chlorine!!! 4 No-Installation-Required models. 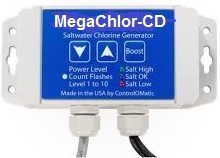 A salt chlorine generator that is affordable and effective. The MegaChlor-CD model can easily meet the sanitizing needs of Spas up to 1,000 gallons and Swim Spas or Pools, up to 17,000 gallons. It features Chlorine Detection Technology, so you'll never over-chlorinate again. Fully capable: 10 levels of chlorine output, self-cleaning, extra Large salt cell plates, test strips and everything, but the salt. Operates independently of the pump or controls. Salt chlorine generators have been used to improve water quality and simplify the daily sanitizing requirements, for more than 30 years. The two MegaChlor models are Plug-n-Play to install. Able to treat spas up to 1,000 gallons and even the largest swim-spas. Operates independently of pump, heater or spa controls. Salt-cell rated to last for 7000 hours. Test Strips included. Just add a small amount of salt, with each refill. SmarterSpa is an Automated, Drape-Over Salt Chlorine Generator, for Spas and Swim Spas. It's SMART enough to know when to produce more chlorine and when to shut itself off. NEVER OVER-CHLORINATE AGAIN. Plug-n-Play design keeps it simple. The Automatic On/Off operation is based on the actual chlorine content. Put an end to having too much or too little chlorine. The replaceable salt cell is rated at 7,000 hours of use. Drape-Over Saltwater System Hot Tub and Spa Chlorine Generator. Just the press of a button, changes power level and chlorine output. Clear cell compartment allows for easy inspection of the salt-cell plates. Self Cleaning design, avoids scale buildup. Features 10 levels of chlorine output, for better control and results. Requires NO installation. Affordably priced and includes everything, except the small amount of salt. Replacement Salt Cell, only. Does not include power supply or test strips. For Small-Average Spas up to 400 gallons, This Salt Cell Can also be used as an ace Replacement Salt Cell only, used in a leading line of popular spas. Suitable for spas up to 400 gallons, that have been equipped, with the required salt chlorine generator, which is not included. Direct replacement part. Includes only the salt cell, as shown above. BioPhotonX™ UV Light Conversion Technology captures and magnifies ultraviolet light, even in ambient light, breaking down a portion of the water molecules and creating Free Radicals. These active Free Radicals attack, weaken and inhibit reproduction of microbes and bacteria, allowing you to use less chlorine and fewer chemicals, in your spa or swim-spa. Needs no installation. This is a simply effective way to reduce chemical usage. Suitable for residential use. Make sanitizing more effective, while maintaining more consistent chlorine levels!!! Products that clean your pool or spa and maintain and keep it cleaner. The world’s first solar-powered, robotic pool surface skimmer operates, whenever the Sun is shining, collecting debris from the pool surface. This helps prevent debris and leaves, which can cause staining, from sinking to the floor. The robot skims and cleans the surface all day. Consumes no electricity and reduces the time required to run the pool pump. Environmentally friendly way to maintain a cleaner pool. Say goodbye to all the hoses and tangles. The boat-like, Remote-Controlled, Pool Surface Skimmer quickly and easily skims the surface of your pool and removes floating leaves, insects and debris. The remote controlled skimmer reaches across the entire pool, in just minutes. The kids will want to clean the pool, using the joy-stick controls. Safe for use in vinyl, fiberglass or gunite pools. Rechargeable battery powered. Return Jet Powered, Pool Surface Skimmer, fits all regular, rigid-walled, above-ground pools and in-ground pools that have a standard return fitting of 1-1/2 inches (38mm). Works off the RETURN side of the pump, NOT the VACUUM side. making it compatible with most pool-floor types of cleaners. The suction is powerful and entirely safe. OK to use with other conventional skimmers. 2 Models for inground or above ground pools. Four (4) High-Tech Models of Robotic Pools Cleaners are the easiest way to clean your inground pool. No installation required. Just plug it in and you're ready to clean. Operates with a safe, economic low-voltage power supply. No hoses to deal with and no priming! Independent of the pool pump. Choose from 4 very capable, high performance models, covering the full range of pool sizes. In this product category, quality definitely counts. The world's first battery-powered leaf vacuum. Fast and Simple to use, with three rollers on the underside providing adjustable height. Fits all standard pool extension poles. Operates on 8 AA Alkaline Batteries, which are included. Replace with rechargeable batteries, for greater economy. Completely Self-Contained and free of hoses or connections. Wastes no water. Far better than any small pool vacuum, that uses a garden hose. Three (3) models of Battery-Powered, Hand-Held Vacuums for spas, small pools, swim spas. Use this handy vacuum to remove sand and debris from the floor. Some models operate on alkaline batteries, which are included and can be replaced with rechargeable ones, for greater economy. Other models feature rechargeable batteries. Built in filter bag, catches all the dirt. One will be just right, for your pool or spa needs. Portable, Battery-Powered Pool, Swim-Spa or Spa vacuuming at its best. Eliminates hoses, cords and tangles. Five (5) NEW models are Lithium-Ion Battery powered, for longer run times and more power. Choose from a variety of more powerful models, for all types of pools, swim-spas, fountains and spas. Select the model with the features, that will best suit your particular needs. The Pool Circulator is an inexpensive and easy to install device that will dramatically improve circulation. Helps to improve water quality, clarity, heat and sanitizer distribution. Improves circulation by as much as 1500%. Better circulation helps prevent silt and debris, from sinking to the pool floor, so that the filter is better able to remove them. Can even reduce the time required to operate the filter. Simply replace the existing standard return jet fittings. The right products make it easier, to keep a cleaner pool or spa!!! Products designed to perform a particular task. You don't need a big pool, to swim endlessly in place. Use in inground or above ground pools. Do it without having to turn around or interrupting your swimming stroke. This is what many Swimming Professionals use. This in not a backyard toy - it is professional-grade equipment. Why spend thousands, when all you need is this Aquatic Fitness Trainer? There's a model, for every type of pool. It's affordably priced and provides a professional workout. Turn your backyard living area or pool into a place of night time wonder. Add some remote-controlled, rechargeable outdoor lights. Use them in the pool or on the patio and create a beautiful dramatic look. Put on a 16 color light show. These weatherproof, waterproof lights come in a variety of shapes and sizes. Completely cordless and wireless, using an induction charging stand. An advanced Pool and Outdoor/Indoor Monitoring System, that collects key information from pools and the surrounding environment. Deep integration of water chemistry, safety, aquatic activities, technology and intelligent software work seamlessly, to provide real-time updates on a variety of pool and environmental parameters. Data is stored in the cloud and accessible, from a variety of devices. Safety Matters!!! The Shock-Alert 24/7 ™ Volt Detector and Alarm System warns of electrical hazards and creates peace of mind and a safer aquatic environment. Shock-Alert 24/7 ™ monitors the pool or spa water, for the presence of electricity, 24 hours a day. If as little as 1.7 volts of electric current is detected, in the pool or spa water, it sounds an alarm, using its built-in buzzer, warning of the potential danger. Safety Matters!!! This 6-in-1 tester is a digital meter, designed to measure 6 important pool and spa chemistry test factors. 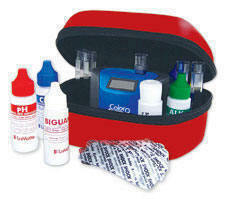 It tests for Salt, TDS (Total Dissolved Solids), Free Chlorine, pH, ORP (Oxidation-Reduction Potential). Requires no testing chemicals. Maintaining a proper salt level helps a salt chlorine generator operate more effectively and helps extent the life of the salt cell. Includes FREE pH 7.0 Calibration Buffer Tablets. Limited time sale. Swim endlessly, in place, in any pool!!! Illuminate the outdoors!!! Safety Matters!!! Test the salt Level easily!!! Products designed with the caring spa and hot tub user in mind. The Fix A Leak product is a patented composition, supplied in a concentrated form, and formulated to seal pool and spa leaks. It can be used with all types of materials, helping seal leaks, present in the shell, walls, floor, fittings, skimmers or circulation system. Fix A Leak cures to form a long-lasting seal, that can eliminate leaks, as large as 1/8" (3 mm) in diameter. We supply expanded supplemental instructions, to all of our customers. For Spas and SwimSpas, Four (4) powerful magnets achieve better results, by removing scale. One Collar set with 4 magnets. Simple to install. Fits pipes up to 2-inches. Requires no power connections. The normal pH operating range, for pools and spas, is between 7.2 and 7.8. Above that range scale can begin to form on underwater surfaces, especially with high calcium hardness. Attach to an ordinary garden hose and THE BLASTER™ automatically rotates your spa filter cartridge, while PowerJets spray focused water to clean the filter pleats. Features a unique horizontal orientation. The dirt will just fall away, as the cartridge rotates and the jets spray water into the pleats. Available in 3 sizes to accommodate all of the common spa and pool sized cartridges. Ultra Poly One Coat is the easy-to-apply, hybrid-epoxy, coating that creates a beautiful new look. This coating can be used on plaster, gunite, marcite, concrete, fiberglass and acrylic spas. Choose from six stock colors. Custom colors are available. Used national in residential and commercial applications - even in alligator wrestling pits. A typical spa requires one gallon of product. 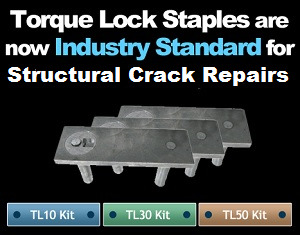 If you have a concrete spa with a structural crack, Torque-Lock could be the solution. Many concrete crack repair methods have been tried, with little success. For example, epoxy injections are largely insoluble in water, but they can't be forced deep into cracks. When Torque Lock Staples are used with epoxy, the repair will be rock-solid. Available in kits of 10-feet, 30-feet and 50-feet. New 5-foot Corner Repair Kits are available. BioPhotonX™ UV Light Conversion Technology captures and magnifies ultraviolet light, creating Free Radicals. which attack, weaken and inhibit reproduction of algae and bacteria. Use less chlorine or bromine. By having this negative effect on microorganisms, the amount of chlorine required, to maintain any level will be decreased. Activated by even limited amounts of ambient light. Simple place it in the spa. The Cover Valet is the world's leading premium spa cover removal system. It is designed to fit in almost any back yard environment; inside of a gazebo, against a wall, or mounted to an existing deck. Dual gas springs easily lift and lower the cover. A locking feature holds cover open, until it's time to close. Removing a heavy, clumsy, spa thermal cover has never been easier! Choice of models, suit most every need. Turn an opened, uplifted, Spa Thermal Cover into a Scenic Backdrop. Why settle for a dull and boring look? Thermal Covers serve a useful purpose: they help retain heat and minimize evaporation. Why look at an ugly cover? Relax and dream away!!! Installs easily. Choice of 2 sizes and several designs. The Spa Side Towel Tree is the stylish way for a spa owner to keep their towel off of the ground and within reach. Its aluminum construction stands up to the most extreme climates and the detailed powder coat complements the look. The towel tree assembles in minutes and is available in a Bronze or Pewter finish. One year, non-prorated factory warranty. The Spa-Side Handrail is probably the most user friendly safety assisting product available. This device provides 180 degrees of movement to allow for easy spa entry and exit. Be safe and enjoy. The Spa-Side Towel Tree is a convenient way, for a spa owner to keep their towel off of the ground and close at hand. The aluminum construction and finish withstands the most extreme climates. Some Interesting Products to Enhance the Hot Water Experience!!! ** Most products can be shipped World-Wide. International and orders outside of Continental U.S. - see comments on product ordering pages.